Social video advertising was a bona fide hit in 2010, according to recent research by Web video analytics firm Visible Measures, as reported on Media Post Daily. This year saw the number of active brands in social media advertising more than double with almost 1,000 brands launching social video ad campaigns compared to less than 450 brands in 2009. Brands that made their mark this year include McDonald’s, Burger King, Adidas, Coke, Nike, Target, Walmart, AT&T, Verizon, Ford and Volkswagen. In fact, some campaigns captured worldwide attention such as Old Spice’s The Man Your Man Could Smell Like, Nike’s Write the Future, and Pepsi’s Oh Africa. These contributed to the more than 1,800 social video ad campaigns this year for a 180% year-to-year increase. How did this news affect views? In 2010, social video ad campaigns generated 2.7 billion views, which is 3.3 times higher than the 820+ million views of 2009. This year’s comments also jumped to 4.4 million from 1.5 million last year. The most-watched category was health and beauty, which amassed more than 390 million views to comprise 14% of all social media advertising for 2010. This largely resulted from Old Spice’s ingenious campaign that landed over 180 million views for the year. Compare that to the mere 44 million views collected by the entire health and beauty category in 2009. “Brands are realizing that social video advertising is a proven, successful and cost effective way to engage their audience on an emotional level”, says Michael Del Gigante, president and executive creative director of MDG Advertising. 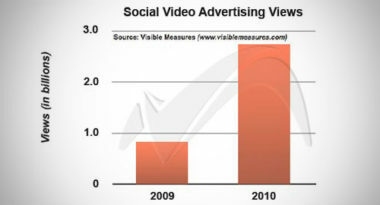 More brands are expected to incorporate social video advertising into their marketing mixes in 2011, according to Visible Measures, who predicts the competition to escalate as campaigns vie for virtual success. Michael Del Gigante is president and executive creative director of MDG Advertising. MDG Advertising, a full-service Florida advertising agency, with offices in Boca Raton and New York, NY, specializes in developing targeted social media marketing solutions, exceptional creative executions and solid branding and media buying strategies that give clients a competitive advantage. To view all MDG corporate identity projects, collateral design, signage, TV and Web design, click here.